This vintage photo postcard captures a most adorable wide-eyed little girl sitting on a wooden chair and holding an accordion. The girl’s expression is precious. She seems happy to be posing for this photograph. She is sitting in front of a collection of her toys including a nutcracker man, a dog on wheels, and a doll. The accordion has the logo of the Cucciolo company. This company operated in Italy and this postcard is likely of Italian origin and produced in the 1930’s. Printing on the reverse of the postcard indicates that the postcard was published on Agfa postcard paper. Founded in 1867, “Actien-Gesellschaft fur Anilin-Farrikation” (AGFA) produced chemical liquids for photography. In 1913, the company becgan to produce postcard papers. The company’s primary factory was located in Berlin, Germany. The pretty costumed blonde actress featured in this real photo postcard is Edy Vayland. She is wearing a fantastic headdress. This portrait is a bit risque for it’s era. Preliminary research revealed zero information about this Belle Epoque theatre actress. The postcard is from the 1910’s and was published in Italy by A. Traldi from the city of Milan. Traldi operated in Milan from 1902-1918. The publisher concentrated on view cards of Europe and the Middle East. They are also known for a series published that focussed on dogs. Research reveals that they produced a number of postcard portraits of European stage performers. If any visitors to the Cabinet Card Gallery have information about Miss Vayland, please leave a comment to educate the rest of us. This vintage real photo postcard features French actress Josyanne (1901-1999) as she appeared in her screen role in the film “Carnelvale di enezia” (1928). The IMDb credits her with 14 film roles between 1924 and 1939 including L’aube de sang (1924), Le costaud des PTT (1931), and Aces of the Turf (1932). This postcard is of Italian origin and was edited by G. B. Falci of Milan. The postcard is part of a series (no. 103). Listed on the front of the photograph is the name Stefano Pittaluga (1887-1932). He was an Italian film producer credited with helping revive the Italian film industry in the late 1920’s and early 1930’s. He began as an owner of cinemas and than expanded to become a powerful distributor of Hollywood movies. Pittaluga further grew his business by becoming a major film producer. 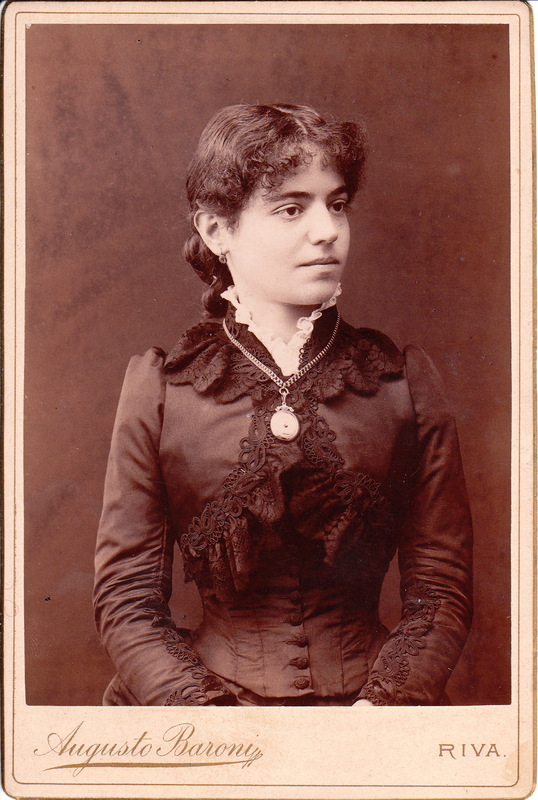 This cabinet card portrait is an immigrant to the Cabinet Card Gallery from somewhere in Italy. The image features a young mother with her arm affectionately around the shoulders of her adorable daughter. Mom is holding a fan and the daughter is holding a small purse. Both the mother and daughter share intense expressions though the daughter is also displaying a wide-eyed questioning look at the photographer. 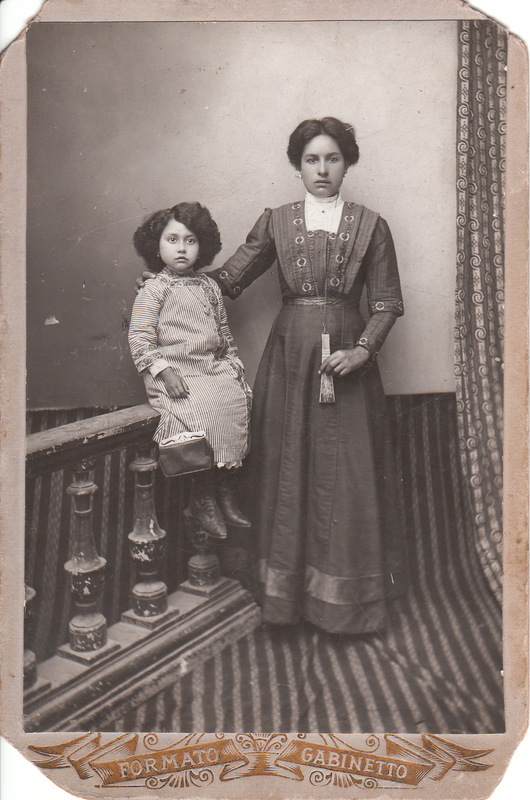 Neither the subjects in this image or the photographer are identified on this well posed cabinet card. A pretty young woman poses for her cabinet card portrait at the studio of Augusto Baroni in Riva, Italy. The town of Riva is located in northern Italy in the province of Trentino. The town is formally known as Riva del Garda. The subject of this photograph is wearing a heavy chain necklace with a locket. She is wearing a beautiful dress. Her very thin waist is likely the result of a corset.